In 1933, British author James Hilton wrote in Lost Horizon about a place of peace and happiness. This place, where the inhabitants were isolated from the ills of the world, was called “Shangri-la.” Some have equated Hilton’s “Shangri-la.” with the mythical Tibetan Buddhist kingdom of Shambhala. Is “Shangri-la” or Shambhala a real place or just a state of mind? Some would argue that there is no difference. 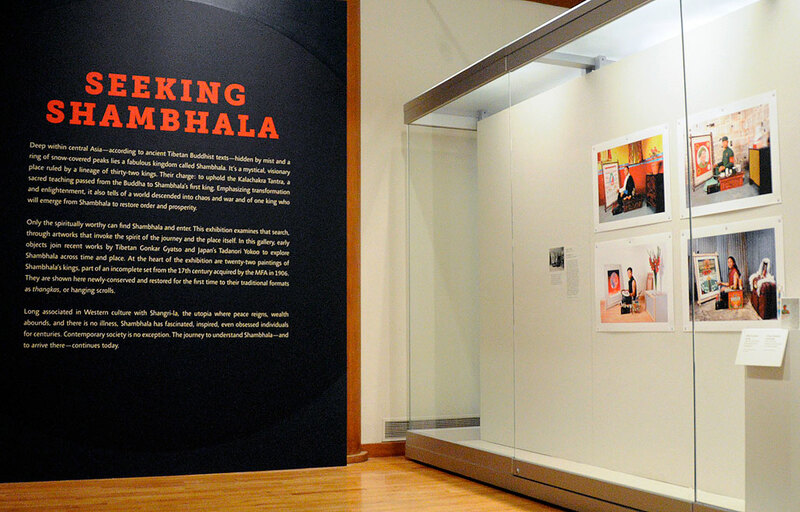 Regardless of one’s personal view, visitors will enjoy MFA’s new exhibit, Seeking Shambhala, an extraordinary look at the spiritual search of this mythical place. The exhibition features more than 60 objects primarily from the MFA’s collection, which has one of the largest sets of Shambhala kings paintings outside of Asia. Complementing these ancient paintings are contemporary works by the Tibetan artist Gonkar Gyatsoand Japanese artist Tadanori Yokoo. 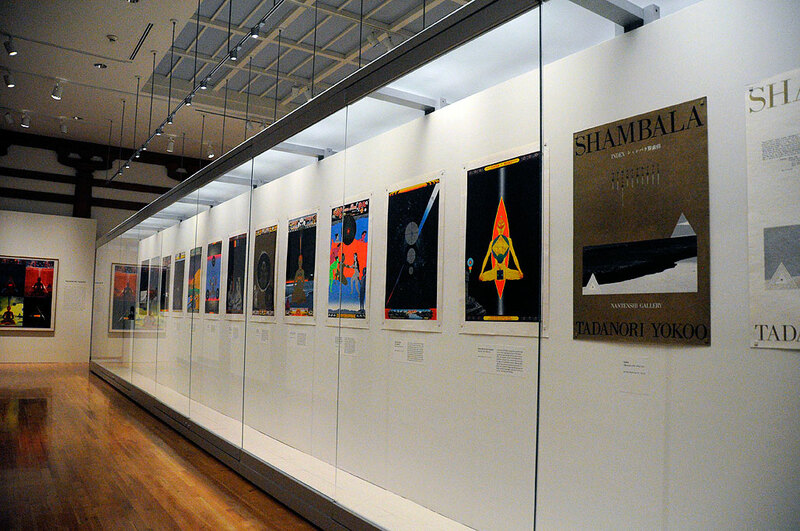 Gyatso’s Shambala in Modern Times is a set of four prints which looks like an infographic taken from Wired magazine. The image is a collage (stickers, newspaper clippings, ads) of text, icons, and symbols taken from our frenetic world. The chaotic energy surrounding the silhouette of the head of Buddha made for an interesting contrast and was quite thought provoking. How does one find peace with the cacophony of all that is going on today? 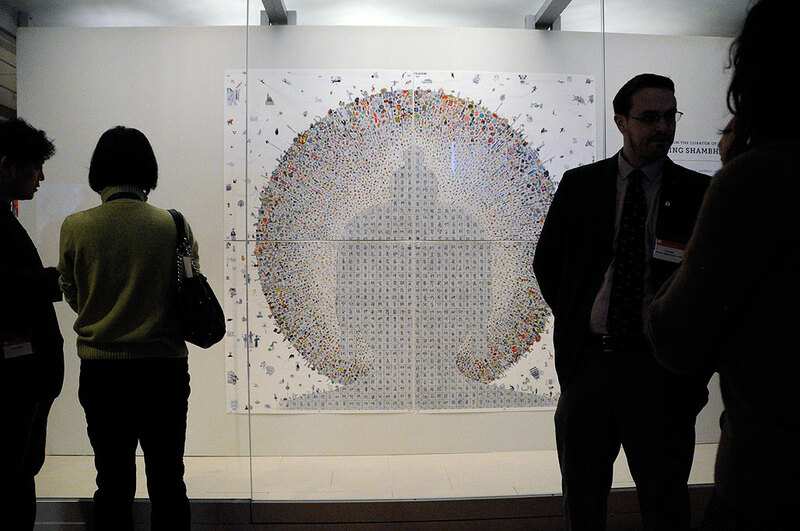 Featured among the contemporary works is Gyatso’s Radioactive, a large cast-resin sculpture of Buddha Shakyamuni decorated with a collage of modern-day references. The sculpture is on view in the gallery at the front of the entrance to the Museum’s Buddhist Temple Room. The Tibetan paintings or thangkas were given to the MFA in 1906 by collector and Museum benefactor Denman Waldo Ross. When the Museum acquired the paintings, they were stripped of their textile mounts. Through recent conservation efforts (an interesting story in itself), these scrolls have been returned to the customary formats as hanging scrolls. The Tibetan scrolls were paired with decorative objects that give a physical dimension to the rich imagery of Buddhist symbols and iconography seen in the paintings. The display in the back of the thangkas is a series of works by the Japanese artist Tadanori Yokoo. These 14 vividly hued silk-screened prints featuring symbolic imagery borrowed from Indian advertisements, the Hindu and Buddhist pantheons, and pop-culture is a fascinating contrast to the ancient scrolls on the other side. Seeking Shambhala is presented with support from the Sharf Exhibition Fund and Petersen Fund for Exhibitions. The exhibition will be at the MFA until September 30, 2012. Don’t miss it!